This post is the fifth post in the series ‘The Story of Thai Democracy’, where I’ll be covering the political history of Thailand since the transition from absolute to constitutional monarchy. You can read the previous posts in this series here. On 29 June 1951, prime minister Plaek Phibulsongkram was aboard the US navy ship Manhattan to attend the transfer ceremony as the United States prepared to give the ship to the Thai navy. 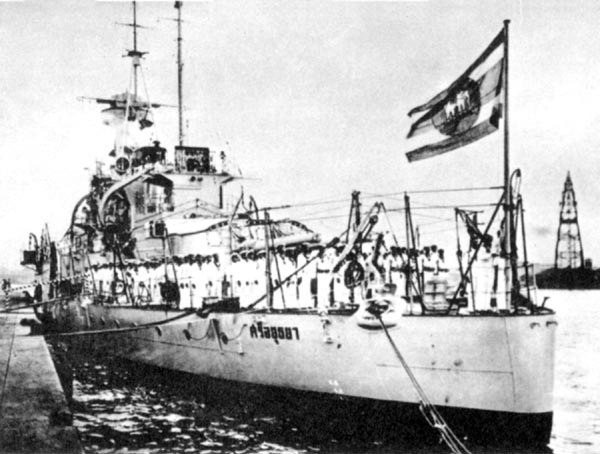 Suddenly, Phibun was seized by the naval officers aboard and taken to the HTMS Sri Ayutthaya, the flagship of the Thai navy. The navy, backed by Pridi Panomyong, was mounting a desperate attempt to remove Phibun from power. The government did not give them a chance to do so. The military and air force heavily bombed the ship, sinking it to the bottom of the Chao Phraya river on July 1. Phibun had to jump off the ship and swim to safety. The Manhattan rebellion is symbolic for many reasons. First, it represented the Pridi faction’s last attempt to return to power; after this, the navy would be comprehensively dismembered. Secondly, the fact that the US was donating the Manhattan to Thailand showed the increasingly close links between the two countries which would become hugely significant in Thai politics. Finally, the episode showed very publicly how diminished Phibun had become, despite still being premier. The fact that government forces chose to sink the Sri Ayutthaya even with Phibun on board showed that he was, ultimately, replaceable. Indeed, in his second premiership, Phibun was no longer the paramount leader of the regime as he had been during his first. Although he was the figurehead of the 1947 coup that sent Pridi into exile, it had largely been executed by veterans who had campaigned in Burma’s Shan States during the Second World War. Among them were Phin Choonhavan, his son in law Phao Sriyanond and Sarit Thanarat. After Phin’s retirement, what had emerged was not the one-man show of the pre-war years, but rather a triumvirate comprising Phibun, Phao and Sarit. Control of the police force went to Phao, while the army was claimed by Sarit; this left Phibun without his own power base. He survived only by playing one faction against another. Initially, the new regime would find it difficult to govern. They had not scrapped parliament when they toppled the previous government. On November 26, 1951, a second coup, known as the “Radio Coup” because it was simply an announcement read out on the radio, was launched, this time to terminate the constitution and disband parliament. The excuse given was that communism was infiltrating the government, and that the government could not deal with the issue under the present constitution; it was the first time the communist threat would be used to justify a military takeover. A new constitution very similar to the one promulgated after the 1932 revolution came into effect; the Senate became fully appointed once more. Phibun’s rule would now be quite different from that of his first premiership. Gone were the eccentric cultural edicts and the personality cult. He found a new way to make himself useful once more: foreign policy. It was time to cosy up with the United States, for they were generous with funding their allies. “By sending just a small number of troops as a token of our friendship, we will get various things in return”, Phibun declared when Thailand became the first Asian country to support the US in the Korean War. He was right: US dollars and arms poured into Thailand. Both Sarit and Phao were able to negotiate huge monetary support for the military and the police in their visits to the US. Phibun also found another new method to strengthen his rule: through Phao. US support had turned Phao’s police force into a virtual army that could rival the military. Phao established the naval police, police cavalry, and even police tank divison; some started grumbling that Phao might even eventually establish a police submarine unit. Using his so-called “knights”, Phao secretly arrested and murdered the regime’s opponents. Four ministers who had served under Pridi were murdered by Phao’s police. Phao was also politically ambitious and built up a parliamentary machine, the financing for which was done through secretive opium trading. Sarit, on the other hand, attempted to stall for time to consolidate his position by continuing to gain support in the army. The two, needless to say, became rivals. However, Phibun found it increasingly hard to remain in power as both Phao and Sarit became increasingly strengthened. In 1955, the man who had once desired to build a fascist autocracy declared that he would now “restore democracy”. A weekly press conference was introduced, political parties were permitted, press controls were eased, and a public ‘Hyde Park’ was even set up at Sanam Luang to allow citizens to voice their political opinions freely. Phibun himself said he desired to run for an elected seat in the National Assembly. But this was simply a method Phibun was using to weaken his opponents. He hoped that the corrupt Phao would be discredited by citizens at the Thai Hyde Park, and indeed he was. As revenge, Phao also encouraged citizens to criticise Phibun, and with his own scheme backfiring, Phibun ended his democratic experiment. Eventually, Phibun and Phao would ally with each other for the 1957 parliamentary elections. Their Seri Manangkasila party “won” the election, but it is now remembered as the dirtiest election in Thai history. Phao’s thugs had intimidated citizens into voting for the Seri Manangkasila, and although the Democratic Party initially led the polls, the results were tampered with enough to conclude with a big win for Phibun. The citizens became so angry that Phibun declared a state of emergency and was forced to drag out Sarit to talk to the civilians. Sarit, despite being the deputy chief of the party, had not participated in the campaign, and chose to speak frankly: “Everyone had cheated”. It was the kind of direct talk that people loved, and Sarit’s popularity was immediately boosted. But the anger did not subside. Sarit, who now had popular support, resigned from the cabinet in 1957, saying that he had proposed reforms to the government but that Phibun had refused to act on them. An ultimatum was handed for the Phibun government to resign, including Phao from his position as police commander. Phibun refused. On 18 September, Sarit launched a coup d’état. Phibun, panicking, fled Thailand. The police headquarters were quickly taken, giving Phao no chance to counterattack; he gave himself to Sarit’s forces and was allowed exile in Switzerland. Neither would ever return. Phao died three years later in Switzerland at the age of 50. Phibun, on the other hand, would suddenly die in Tokyo after lunch in 1964 at the age of 67, amid chatter that he and Pridi were about to return to Thailand to restore the Khana Ratsadon. Many suspected that he was poisoned. And so ended the life of Plaek Phibulsongkram, the man who had ruled Thailand for almost two decades. In the next post, I’ll be covering Sarit Thanarat’s premiership.